When purchasing a house and entering into an agreement to have a realtor represent you, you’ll have two choices. You may choose to enter either an “Exclusive Buyer Representation Agreement” or a “Non-Exclusive Buyer Representation Agreement”. Each type of agreement is suitable under different types of circumstances and it will be up to you to decide which is best for your situation. Your real estate professional can review each agreement with you and assist you in deciding which is appropriate for you. The biggest difference you’ll notice between these two agreements is the section titled, “Our Agency Relationship”. This section determines what type of relationship you’ll have with your real estate professional and clarifies whether you’ll enlist the help of only one real estate professional or if you’ll solicit assistance from other professionals or brokerage agencies. The next major difference you’ll notice between these two agreements is the “Fee, Retainer and Limits On Payments” section. 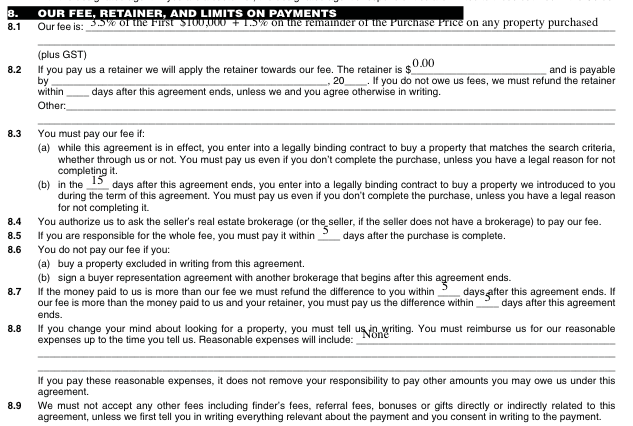 In the “Exclusive Buyer Representation” agreement, you will come to an agreement with the real estate agent regarding fees. In the “Non-Exclusive Buyer Representation”, it states that you authorize your agent to ask the seller or their representative (be it agency, brokerage, etc.) to pay the fees for the sale of the property and that you will not be responsible for payment of the agent’s fee in any circumstances. Whichever agreement you choose, it will have a timeline assigned to it and agreed upon by both you and your real estate professional. It will also outline what types of services will be offered to you and what fees will be required for such services to provide you with buyer representation. Both agreements also state what will constitute a conflict of interest and will help you to understand both your and the agency’s responsibilities. Once the document is signed, copies will be provided to you and a copy will be kept on file at the agency. Both agreements, exclusive and non-exclusive, will remain confidential, even after the agreement expires. To view copies of the “Buyer Representation Agreement”, both exclusive and non-exclusive, please provide your email below and download the documents for free.